Nikolai Mikhailovich Karamzin was not only a legendary writer, a talented poet, an excellent translator, but also an excellent historian. He had a great influence on the formation of the linguistic and literary culture of the country. It was he who translated many works of William Shakespeare from English into Russian. He did this work very subtly, trying to preserve the meaning and interesting speech turns. The most famous of his work was the novel “Poor Lisa”, created by the author in 1792. Of course, such a person should be perpetuated on canvas. The artist, who captures Karamzin, was Tropinin. This man was a real master of his craft. He did not take a special part in exhibitions, did not seek to push out his talent or to declare himself loudly. However, his broad soul, humanity and ability to be a good friend made him an influential artist. 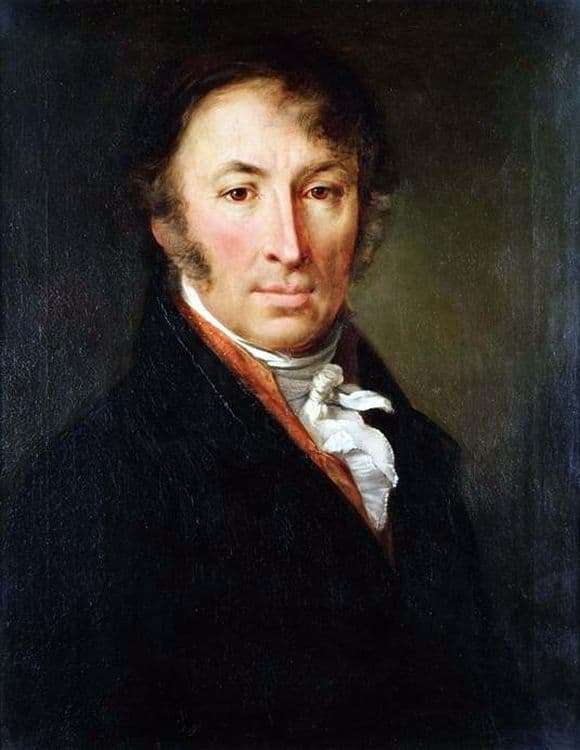 In 1818 he was lucky to work on the painting “Portrait of N. M. Karamzin”. The product is made on canvas with oil. Karamzin depicted close-up. Even the minute details of his clothes are clearly distinguishable. His gaze is at the same time full of warmth and severity. The picture is very accurate and realistic. Throughout the guise of Nikolai Mikhailovich, his belonging to the intelligentsia, a good upbringing and a high level of education are read. The background is a neutral dark green shade. This allows you to focus on the writer.